Would you like to build total brand blog/news/articels for your company website or clients? 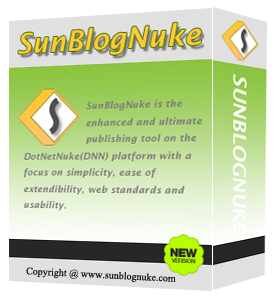 Congratulations, the SunBlogNuke module is your exact choice. If you are finding a highlight solution to display pictures on your DNN website, the GalleryPlus module will be exactly what you need. It is ultra photo gallery framework built on top of DotNetNuke(DNN) platform. The aim is to simplify the process of creating professional image galleries and slideshows for the dnn website. Out of the box, you can manage your albums & photos; plus feel free to build your own customized interface by lots of external resources without any complicated code, such as any jQuery gallery & slider plugin you can find. Comments+ is the cross-module & highlight comments solution based on DotNetNuke platform, in other word, it will be a universal comments/voting system to be integrated with across multiple different modules on a dnn site. Until now, this module allows you to very easily add the popular comments engine, such as Disqus & Facebook comments, any page on your DotNetNuke website, and also attach it to a specific module on the page. If you are finding a highlight solution to display your most recent Twitter updates on your DNN website, the "Twitter Feed widget" module will be exactly what you need. With the free widget, it is easy to integrate the twitter feed into the sidebar of dnn blog to show your latest tweets. Out of the box, you just need to specify the public twitter account info (username) and this dnn widget will do the rest for you. Moreover, you can control how tweets are displayed from widget settings panel, such as Number of displayed Tweets & whether to Show Replies. The cache mechanism also let your dnn website avoid critical website load traffic.